If I told you I watched a movie about an old man, a young woman, and Paris, entitled Last Love, you might very well think it was a reboot of Last Tango in Paris. And you would be wrong. This movie is not that. No, not that at all. Fifteen years ago, Disney got their hands on Hua Mulan, the legendary Chinese heroine, and used her to anchor their decidedly meh-worthy film, Mulan. Disney’s treatment was not the first film attempt to tell the story of this 6th century legend (the first film was made in 1927) nor, thankfully, was it the last. 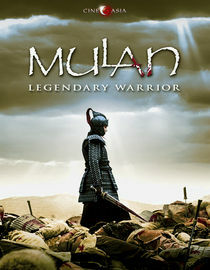 Mulan: Rise of a Warrior (2009) is a live-action portrayal of the classic story of a young woman who, to save her ailing father, poses as a young man and takes his place in the military during the battles between the nation of Wei and the tribes of the Mongolian steppes. She spends twelve years a soldier, rising through merit, achieving the rank of general. When the war is resolved, she refuses the offices and lauds offered her for her service, and instead returns home to her village. While no one is going to really mistake Zhao Wei for a man, she is by far the best choice from the other reported candidates under consideration. Moreover, Zhao turns in a strong performance, building layers of nuance and contradictory emotions, melding fury with vulnerability, grief with honor, and showing us through a strong and character-driven script a real character of strength. Movies from China tend to have three things I dislike. I don’t like “wire” movies, where everyone is unconstrained by the laws of physics. I don’t like the Hong Kong Cinema kung fu movies, where again, physics are optional. And I don’t like the thoroughly predictable and incredibly depressing endings that a lot of movies out of modern Chinese cinema seem to have. Therefore, this Mulan is a winner on several levels. It is not a “wire” movie, the battles (though many) are fairly earth-bound in their construction and execution, and though the film doesn’t end with a Big Red Bow, it’s a believable and realistic (for the time) outcome to an exceptionally unusual situation. More importantly, it’s a satisfying ending, and that’s too rare in the modern Chinese cinema (in my opinion). Some of the characters are rather two-dimensional; villains are villainous without reason, and tyrants are tyrannical because it moves the plot along. Secondary characters are generally the same quirky but loyal caricatures of soldiers you’ll find in any film about the military. However, these failings do not pull down the whole movie. The complexity of characters like Mulan, Wentai, Fei, and the Rouran princess keep this film above the norm, and the intricacies of their relationships–the depth of their thoughts and reactions–keep us engaged. Also worth mention is the exceptional costume design and art direction, which combine to give a verisimilitude to the exteriors, armor, and battles that can only enhance our enjoyment. Nothing stands out, here, as being anachronistic. Exception to the above: for some reason, the director chose to cast a Russian singer, Vitas, as a servant to the Mongol khan. He seems to be there solely for his talent as a singer (his falsetto voice is remarkable), but he stands out like, well, like an Anglo amidst the Mongol horde. Frankly, I found him a distraction, and totally unnecessary to the tale. Overall, though, I really enjoyed this movie, and would recommend it for any rainy weekend this winter. When I learned that Depp’s “look” for the whole film was going to be KISS-like black and white face paint and a dead raven headpiece, I thought that, while such might have been appropriate for a ceremony (depending on the tribe and the situation), it seemed off-the-mark as daily appearance. When I learned that it was taken from a painting, and a painting by a non-native painter at that, I said, “Ah. When the reviews for this 2013 reboot of “The Lone Ranger” began to come in, they were overwhelmingly bad. As reaction to Depp as Tonto began to come in, it was almost universally bad. The native community’s reaction? You can sum it up in one word: Meh. Why? Why this one-sided response from the hegemony and this tepid response from the population who (whites think) should be the most outraged? Simple. The native population of this country has a much (much) lower expectation of whites than we do of ourselves. In short, we’ve never done it right before, so why would anyone expect we’d start to do it right, now? Especially when starting with something that has such a woefully racist history (“The Lone Ranger”) and a company that has such a woefully racist track record (Disney)? From what I’ve read, reaction in the native community is nuanced, realistic (some might say “jaded”), and pragmatic. Why Depp instead of a native actor? Because it’s a big blockbuster movie and Depp will bring in the bucks. As to the inaccuracies of Tonto’s appearance? To quote Eyre, “It’s Hollywood’s invention of a Native American. It’s a farce, and his character is a farce character.” In other words, it’s a movie, people, and you never go to the movies for historical accuracy, especially not a summer blockbuster. Balancing these opinions, many in the community are pleased by some of the behind-the-scenes aspects of the movie. There was broad use of native actors in supporting roles and as extras. The film was shot on native land, and the production company poured a lot of money into local businesses, helping the local economy. Disney put a chunk of money into the American Indian College Fund. And, on a larger scale, the movie has reinvigorated the discussion around the portrayal of Native Americans in film, and that’s never a bad thing. Yesterday, after posting about “Persuasion,” I asked my online peeps what their favorite on-screen kiss was. I did not ask for Best; I asked for Favorite. When Best walks in the door, it has Judgment on one arm and Argument on the other, while Favorite is pure opinion. You can’t argue or judge someone’s favorite. Best is an opinion. Favorite…Favorite just is. The list was interesting, and I was surprised by each and every response, in one way or another. Some choices hinted at the flip-side of my friends’ personal coin. Others were obvious sentimental choices. Others were temporal, tied more to a time or event than to the movie itself. All were illuminating, and I can easily see how any of them could be someone’s favorite. As with everything, this is all grist for the novelist’s Character Creation mill. The quirks and quiet, inner details of personalities fascinate. People are like fractals: the deeper you look, the more detail you see. Mother’s Day was spent, in part, watching dramatizations of Jane Austen novels. I’ll freely admit that this is not a tiresome chore for me. I love Austen’s novels, as does my wife, and we have nearly every dramatized version of every Austen novel, so we often have discussions of which version is best. The answer often boils down to, “This version is best for a lazy Sunday, but this one is best for a Friday night.” That sort of thing. Full disclosure: Persuasion is my favorite of the Austen novels, but I do believe I was sufficiently objective in my decision. Was it enjoyable? Yes. Was it exciting? Yes. I haven’t even seen all of this year’s nominees, but I’ve seen two others from the list: Spielberg’s “Lincoln” and “Silver Linings Playbook”. In that short, three-title list, “Argo” is third in my opinion. “Argo” has many virtues. The costume and set design were top-notch. The art direction was quite good. The acting was (for the most part) very good. Where it falls down is in direction and screenplay. We picked up two “buddy” films this weekend. One was a buddy/fish-out-of-water mashup, and the other was a classic buddy/caper film.